If you're making this cake for kids, call it a "Better Than Anything Cake!" Another name for the cake, Robert Redford Cake, probably dates back to the 1970s. This is a popular, irresistible chocolate cake dessert with loads of chocolate, caramel topping, candy bars and whipped topping. Use your favorite chocolate cake recipe or bake a cake with a cake mix for this scrumptious dessert. Bake the cake and leave it in the pan to cool slightly. While the cake is still slightly warm, make holes in the entire top of the cake using the handle of a wooden spoon or a large fork. One at a time, pour the fudge and butterscotch toppings and condensed milk over the top of the cake, letting each flavor soak in before adding the next. Crush three of the toffee candy bars and sprinkle over the top, or sprinkle with chocolate and toffee pieces. 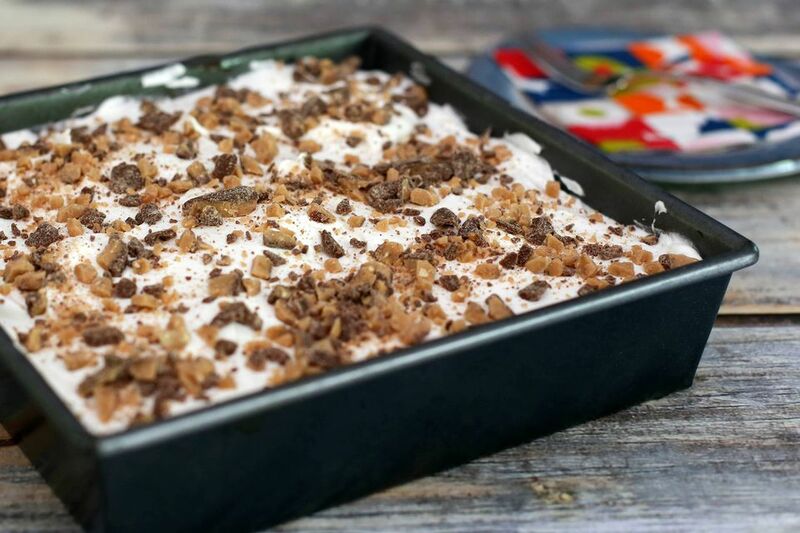 Crush the three remaining toffee bars and sprinkle over the whipped topping. Cover and refrigerate for at least a few hours, preferably overnight.